Welcome to the November 2018 newsletter of Let’s Move in Libraries. This edition highlights: a) two upcoming free webinars, b) an update of our collaboration with the National Institute on Aging’s Go4Life campaign, c) the story of physical activity at the Champaign (Illinois) Public Library, and d) reviews of Get Your Community Moving: Physical Literacy Programs for All Ages. Follow (and share with) Let’s Move in Libraries on Facebook, Instagram, Twitter, and YouTube to stay up-to-date with what public libraries do to get their communities moving. This month’s featured image comes from Western Australia, where stationary bikes have been installed at the library. 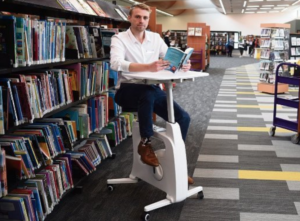 Read more about this exciting initiative, and also check out this story about how and why the Bibliothèques Montréal in Canada acquired 57 stationary bicycles for their libraries. Do you have stationary bicycles or other active study/reading spaces in your library? Let us know! We’d love to hear about your experiences. Learn how and why to move in libraries! During the next two months, we are teaming up with the National Network of Libraries of Medicines and OCLC/WebJunction to offer two free opportunities to learn how and why to support healthy physical activity in libraries. On December 4, project director Noah Lenstra will present “Don’t do it alone! Starting, sustaining, and assessing partnership-driven health programming at your library” for Kernel of Knowledge, an expert-speaker webinar series from the Greater Midwest Region of the National Network of Libraries of Medicine. Sign up and join us for this free learning opportunity! Then, on January 8, we are teaming up with the OCLC/WebJunction to offer to the free webinar “Health Literacy Begins at Your Library.” In this webinar, Leslie A. Gelders, Literacy Administrator, Oklahoma Literacy Resource Office, Oklahoma Department of Libraries; and Marcia Johnson, Library Director, Miami (OK) Public Library will share with you ideas for simple (but powerful) health literacy programs you can offer at your library regardless of your size or budget. This webinar is free! Sign up and participate. We are continuing our successful partnership with the U.S. National Institute on Aging (NIH)’s Go4Life campaign, which focuses on increasing exercise and physical activity among older Americans. “Go4Life in Public Libraries” is a mini-project that Let’s Move in Libraries is helping develop with Go4Life. Does your library use Go4Life resources for programs? Let us know! Your input will help form the direction of this initiative. Here’s an example of a successful Go4Life in Public Libraries program. In Birmingham, Alabama, the Springville Road Regional Branch Library offers Go4Life programs twice a week. The program consists of a gentle exercise program based on the National Institute on Aging’s Go4Life program. Led by volunteers, this exercise program builds strength, flexibility, endurance, and balance. No age limit. Check out what they do, check out Go4Life, and try something new at your library! This month’s featured library is the Champaign Public Library in Illinois. Connie Fisher, Library Associate in the Adult Services Division, reached out to us to share her library’s story. Share your library’s story with us and we will feature you in a future newsletter! Connie said that in addition to “hosting another successful Fit & Fabulous series this summer, [the library] added two senior programs under the Out in The Garden title. We are planning to expand this series in 2019. All the programs were a hit with our patrons! “This fall, we are venturing into a new area for us: a three month series of Chair Yoga. Steve Willette, a local premier yoga instructor, comes in every Tuesday at noon to share the practice of yoga for an entire hour. All patrons of all abilities and mobility are welcomed into this free class. As word gets around we are getting more participants each week. Connie hopes to develop a 2 month dance series at the library in 2019 as well. Share your library’s story with us! Reviews of Get Your Community Moving: Physical Literacy Programs for All Ages. The reviews have started coming in for library director Jenn Carson’s book Get Your Community Moving: Physical Literacy Programs for All Ages (ALA Editions, 2018), and they are all extremely positive! Have you read this book yet? Leave a review at GoodReads. Follow (and share with) Let’s Move in Libraries on Facebook, Instagram, Twitter, and YouTube to stay up-to-date with what public libraries around the world do to get their communities moving. Tag us on these platforms to share what your libraries are doing! Share with us your news! Tag us on social media and email news directly through our website. We’d love to hear from you! Subscribe to the monthly Let’s Move in Libraries newsletter for monthly editions of success stories, educational opportunities, and food for thought that will deepen the impact of movement-based programs and services in public libraries. The Let’s Move in Libraries project focuses on how public libraries create opportunities for individuals of all ages and abilities to engage in healthy physical activity.